The busiest part of the convention season is when the weather is often crummy (late fall, late winter/early spring). The skywalk comes in handy when exhibitors want to preserve their appearance while carrying small items for their display from their room to the GCCC. They will have to go to street level to go anywhere but the Convention Center. ...the street scene is for leisure time. They will have to go to street level to go anywhere but the Convention Center. Not necessarily. The Convention Center includes a wide range of dining options in the form of their existing food court, restaurants, and bar. The new Hilton Hotel will also include multiple restaurants and bars. If you park your car in the garage, there's really no reason to go outside at all. Unless maybe you want to get your car out and check out the fabulous offerings of Polaris or Easton. The new renderings have just been released. From Planners unveil convention hotel. That's pretty bland and boring design. Gotta love all that blank brick wall at the base. Definitely would be a bleak experience walking past this. Convention centers and their accessory buildings really need to do a better job to liven up their immediate surroundings even during non-event times. This hotel isn't helping. When I hear clients talking about how they want to liven up a commercial street, or make an area exciting or welcoming to the public, I'd be thinking much differently than this. Exhibitors and attendees often avoid hotel/convention center bars and restaurants in order to take a break from the show, seeing the same people and the general sterility of facilities oriented to the convention and trade show business, especially people who go to a lot of them. Trust me, when the show is over for the day people want to go someplace else, even if it is the bar across the street. Here's a photo of the future site of the hotel from the lower grade. Goodbye parking lot! Farewell surface lot next to a perfectly good parking garage. I still think they should put the connector UNDER high street. You can see there is already a bridge in Walker's photo. That hotel design is terrible! Everyone has a right to their opinion. But I'd expect more than a five word criticism on a $140 million proposal. Especially from someone who operates an urban issues website. Come on, that building looks like a commie block. It's like a classic interstate highway hotel design. Terrible. Lest you think I'm getting down on Columbus, Indy has a bunch of them even worse than that. What bugs me is not that a private company decided to erect low quality architecture on a prime downtown site, but that so much tax dollars are going into it. Public investment is the big lever to insist on quality architecture, so it always disappoints me when it isn't delivered. On the whole, I'm a big Cbus fan and think the Arena District was done very well, but this hotel isn't worth of the city. But a terrible communist block interstate highway hotel design? Sorry, you're on your own with that one, arenn. If you're referring to Hilton as the private company, I don't believe that they were actually involved in the development/design. From what I've read it sounds like the hotel will be built by the Franklin County Convention Facilities Authority (ie: Convention Center) and Hilton has been tapped as the managing partner. Ground was broken yesterday for the new Hilton Columbus Downtown, which already is bringing in more convention business. Officials say that justifies the public financial stake. After a decade of discussion and several years of study and political wrangling, dirt was moved yesterday for a publicly financed, 532-room hotel across from the Greater Columbus Convention Center. Representatives from Franklin County, the city of Columbus and the convention industry spoke at a rain-soaked ceremony on the surface parking lot that will be home to the $140 million Hilton Columbus Downtown by fall 2012. Found a panoramic photo of the Hilton/Convention Center Hotel construction site at flickr. The photo is dated December 31, 2010. It looks like it was taken from Front Street looking east toward High Street and the Convention Center. The construction site spans from the brick buildings on the left to the railroad tracks on the right. From the renderings I'm afraid that this hotel will rival only the Convention Center itself in the battle of who can have the worst street presence. I was downtown today and they now have 2 cranes up. I didn't have my camera with me but it was nice to see construction cranes downtown again. I doubt it would "win" this battle since it's up against an enclosed fortress. This one will have more windows. Oh wow, I just noticed that the Southern Baptist Convention is looking at a visit in June 2015 to bring 16,000 visitors, just in time for the gay pride parade. That spectacle will be worth the trip back. Add my vote for the Convention Center winning this battle too. Remember that the Convention Center was designed by "starchitect" Peter Eisenmann. He's a master at the windowless fortress with bad street presence. In about a month, work on the new Hilton Columbus Downtown, across from the Greater Columbus Convention Center, is expected to hit a milestone: The construction site should become level with High Street. The hotel is being built on a long-vacant lot next to railroad tracks below the grade of High Street. Glad it's coming along. Any replacement of a surface lot is great. "The new Downtown Hilton Hotel broke ground last summer. There’s been quite a bit of progress made on the foundation work lately, and the 500-room hotel will be going sky-high soon. The planned opening is Fall 2012." The Hilton Columbus Downtown Hotel now has a construction camera set up (link below). It looks like the camera is mounted on the roof of the Nationwide Insurance HQ Tower, which is located a block south of the hotel construction site. An update on the Hilton Columbus Downtown Hotel from its construction camera (link below) which is mounted on the roof of the Nationwide Insurance HQ Tower, a block south of the hotel construction site. The previous image was from June 2011. The below image is from Sept. 30, 2011. Some more photos on the Hilton Hotel construction progress. I don't think the hotel adds to the area being more of a destination, but is rather a response to the popularity and density of what's been on offer here. And here I was wondering who this Columbo newbie was: not so new ;) . Pablo, a poster at Columbus Underground, recently got a tour inside the under-construction Downtown Hilton Hotel. He posted the photos from that tour here at flickr and here at CU. Lots of concrete and lots of scaffolding. The interior atrium is really something - even at this stage. This hotel was listed as a factor in selecting Columbus as the 2013 host of the NHL All Stars Game, as well. Yes. The NHL did note the addition of the 500+ full-service hotel rooms as one of the determining factors when awarding Columbus the 2013 All-Star Game. Looks like the hotel did make the area more of a destination after all. Looks like an expansion of the Arena District, but with a higher glass-to-brick ratio. I noticed a construction project/crane in the bottom left of the construction webcam. I am pretty sure that is a separate project, correct? Columbus CEO Magazine: High-Rise Hopes - When it opens in late 2012, the Hilton Columbus Downtown could be a game-changer for the city’s meeting and events business. An updated view of the hotel from its construction camera (link below). The brick facing is nearly to the top of 14-story hotel. The new image clearly shows the progress of two other construction projects near the Hilton site. Just west of the hotel (to the left in the image) are the wood forms for a vertical addition to the CFA Vine Street Parking Garage. South of the hotel (to the bottom left in the image) is the steel framing for a 5-story, 200,000 sq. ft. Nationwide Insurance office building. Two recent views of the Downtown Hilton Hotel under construction from around the web. 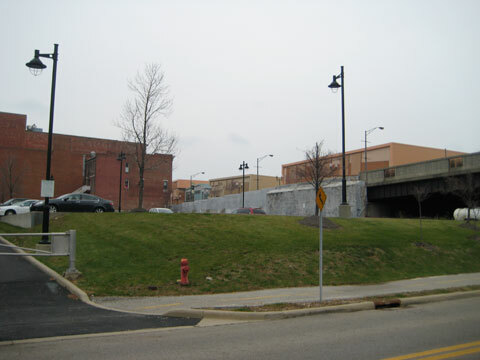 The first photo is a street level view from Vine and High Streets looking south from Columbus Underground. The second is from one of the upper floors of a downtown office building located just south of Nationwide & High from CBusCommuter. This photo looks north and shows the Hilton Hotel framed between the 1970's era Nationwide Insurance HQ Tower to the left and the 1980's era Hyatt Hotel to the right. Nationwide Insurance's nearby five-story, 200,000 square foot office building at 10 W. Nationwide Boulevard is also seen under construction in this photo. I cannot wait until the sidewalk is again open. That block is horrid to pass because Nationwide now has it closed on the Park Street side as well.